When the heat of summer rolls around each year, families all across the world seek refuge in the cool waters of a local swimming pool, lake or at the beach. While plenty of people may have the option to go to a public swimming pool or take a quick drive to the ocean, the reality is that many people live far away from such luxuries and/or may wish to have their own private getaway for summertime relaxation. In the past, anyone who wanted to build a swimming pool would need to first consult with a contractor and determine all of the specifications and design details through them, which can often lead to a more expensive pool project. Technology, however, has made it possible for home owners to evaluate various designs and conduct initial planning for any swimming pool before they decide who to hire. In the following article, we will discuss three Android applications that are perfect for the planning and design of any new swimming pool. When you first consider the addition of a new swimming pool to your property, how do you imagine the overall layout? Will you want a simple, compact ovular design or an Olympic-sized variation? Some people may wish to have an above-ground swimming pool in order to save on costs, while others will decide that an in-ground solution is best for them. 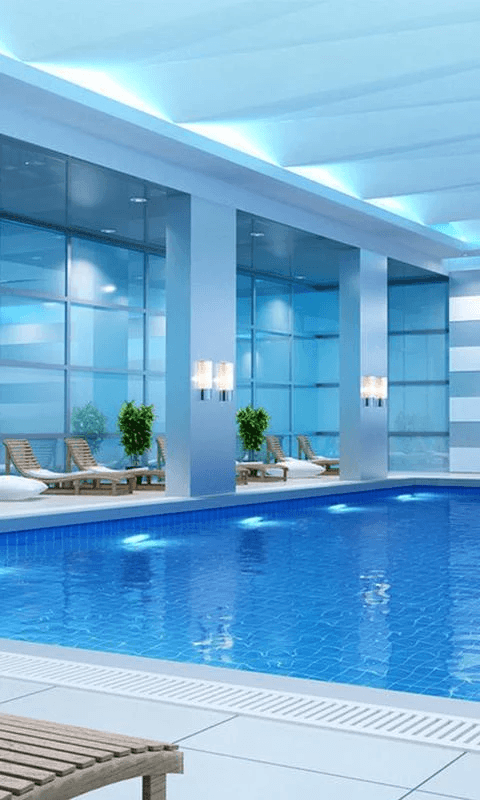 Whatever your ideas and budget, the Swimming Pool Design app for Android devices is an excellent addition to the smartphones and tablets of anyone who plans to add a new pool to their home. Users will be able to flip through dozens of different, professionally-designed swimming pools in order to find a design and a style that suits their needs. Once you have found a winner, you can then save the design directly to your device and share it with friends, family or your future contractor. This app is free and can be downloaded from Google Play. Maintenance costs are a huge consideration for any new pool, so it is vital that you first understand what the total cost of ownership will be before any construction begins. The Swimming Pool Volume app is an Android solution that can calculate the number of gallons of water that will be needed to fill any swimming pool. This app will show not only the number of gallons of water needed, but also the total surface area of any proposed pool. This information will then permit home owners to calculate the annual costs of pool treatment and maintenance. Available for free, Swimming Pool Volume is a great planning tool for any future pool owner. Last but not least, the Build Your Own Swimming Pool is a design and instructional book/app that walks proficient users through the processes that are required for the construction of any pool. Users will be able to learn about various pool types, how pools function, installation tips, regular maintenance functions and how to test your water. Currently available for free, the Build Your Own Swimming Pool app can be an excellent way to experiment with a new pool installation if you have the tools and expertise to do so.